Welcome To Signed Memorabila 4 U! Home of Authentic Sports & Music Memorabilia! Here at Signed Memorabilia 4U we offer one of the largest selections of fully authentic, guaranteed, signed memorabilia in the U.K! 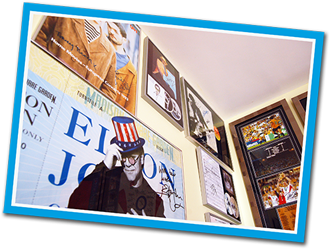 Ranging from signed sport memorabilia, signed music memorabilia and signed film & tv memorabilia. Most of our items are unique one off items, rather than multi signed items by artists and sport stars. We also frame most of our items, so they are ready to hang on your wall. Our range is comprehensive in all areas, ranging from signed football memorabilia, autographed rugby memorabilia, autographed cricket memorabilia and many other sports, which are popular in the Uk. We stock signed football memorabilia, ranging from most Premiership sides and European Teams right up to International teams. Rugby Memorabilia again ranges from National to International teams. We also specialise in signed match worn shirts in football, rugby and cricket. Truely unique and are really one offs!!!! Our music autographs,signatures and music memorabilia range from signed albums, signed cd's, signed guitars, signed photos and music awards.They tends to relate to stars and groups of the last 50 years, ranging from the Beatles to Oasis. Most items are obtained from recent concert tours and promotional events. We also offer a 'request' service which is quite unique! Whether you're sport crazy or music mad, just let us know whose autograph you would like, and we will try and get it. Think of us like your own personal fairy godmother... for all things autograph related! Our range of items go from signed autographs from music concerts and film stars to signed sports memorabilia, ranging from signed football shirts to items from great olympians. It's also important to note that all of our autographs are original, and all our signed memorabilia come with Certificates of Authenticity, which are personally guaranteed by us. If you ever find that any product you have purchased from us is not genuine we will gladly give you a full refund, because we know it will never happen! We even offer a bespoke framing service for your own sport and music memorabilia, so if you have a football shirt, a signed poster or even some sort of music collectable, such as a signed guitar we can help you there! Remember, any sort of memorabilia - particularly signed memorabilia is prized and very collectable! Due to the rarity of unique sport memorabilia and autographs it is one of the few investments likely to ONLY rise in value! If you have any questions about any of our items, please don't hesitate to contact us either via e-mail or phone! or live chat.